Misinterpretation of words, mixed messages and vague communication happen all the time, more so in today's world. It doesn't matter if the same language is used during the communication process. Miscommunications still happen both in oral and written communication. In the latter, the propensity to be misinterpreted or misunderstood is even greater. Written words could easily be misconstrued because there is no benefit of facial expression, body language or tone of voice. The length of the message or text does not matter. One word, a short phrase or whole sentences and paragraphs might seem ambiguous. It all depends on how the text is written or on the frame of mind of the recipient or reader. In the realm of online or digital communication, it is easier to misunderstand written text. Good thing there are emoticons that help clarify what is being said. Emoticons serve as the visual representations of moods and feelings. Its use provides the recipient of the text some form of emotional cue to the mood behind what he is reading from the author of the text. The most popular emoticons :-) and :-( are very straightforward. One represents a happy face while the other is a sad face. When you see these in a text message or within a longer text like a blog, you would have a general idea of what the other person is feeling or the prevailing mindset at the time the sender wrote the words you are reading. Today, it is the norm for people to use emoticons in their communications. Emoticons were initially used in electronic bulletin board messages and emails. When text messaging through mobile phones became popular, emoticons became part of that communication method. As the Internet grew bigger and the world became smaller because of this, emoticons became a staple of everyday communication in chat rooms, web forums, social networking sites and other places in the Internet-sphere where messages that require emotional validation are put out for people to read. The word emoticon comes from the combination of two words: "emotion" and "icon." Emoticons are graphical or symbolic representations of one's facial expression through the use of letters, numbers and punctuations marks. The representation is based on characters found on the keyboard of your computer or electronic device. A person uses an emoticon to let the intended recipient or reader of a text know the writer’s prevailing mood when he was composing his statement or message. Emoticons are also used to subtly let the reader know about feelings that could not be expressed in words, due to shyness or maybe because he or she is not used to using verbal or written communication when it comes to expressing deeper feelings. Emoticons therefore are great as a tool for showing, indicating, expressing, conveying, graphically verbalizing, articulating, or declaring what one feels at any time. Previously, an emoticon is often read sideways from left to write. The eyes are usually represented by the colon [:] with the mouth represented by the close parentheses ‘)’ If the user chooses to, he can add a nose using the dash [-] sign. Therefore, when you see this emoticon, :-) that stands for a smiling face, which denotes happiness or joy. This :-( on the other hand is the representation of a sad face. This combination of characters is what would appear in some written messages, be it in an email message, a short message via a mobile phone or any written text, when the graphical representations of the emoticons are not enabled or not available. Other letters, numbers and symbols on the keyboard are combined to create pictorial representations of feelings and emotions, with the help of the Alt key. For example, pressing the Alt key and the numeral one on the keyboard would give you a “smiley” with only outlines like this one: ☺, while Alt + 2 would result in a solid “smiley” in reverse, meaning it is black with white eyes and mouth, like this: ☻. Alt + 3 gives you a solid heart. No one knows how many emoticons there are in the world. The number of emoticons that could be created depends mainly on the creativity of those who come up with them. Fahlman, the father of the smiley? It only took a few months for these emoticons to spread not only within Fahlman's circle but also beyond. Many more other character sequences were created because of the popularity of Fahlman's suggestion. It is important to mention the word "online" earlier because even before Fahlman's now famous post regarding the use of his sideways emoticons, the "smiley face" had already been around for a few decades. The smiley face was created by Harvey Ball in 1963. Ball used two black dots for the eyes and an upturned curve for the mouth that was set on a yellow button. 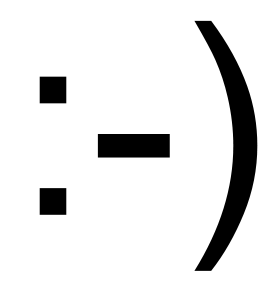 Ball's smiley face was most likely the inspiration for Fahlman's digital smiley face. Some sources point to other people suggesting the use of typographical signs to represent a smile and other emotions way before Fahlman. Even Fahlman acknowledged that he was probably not the very first individual to use the smiley online. But he does believe that it was his suggestion that started the ball rolling. The good thing is Fahlman has never capitalized on this notoriety nor made money off his two original emoticons: the sideways smile and frown. Today, Scott Fahlman is still a Research Professor in the Language Technologies Institute and in the Computer Science Department of the prestigious university in Pennsylvania. There is no age limit when it comes to using emoticons. That's what is fun about it. Emoticons are very useful in clarifying the spirit of the text. The problem with text messages and such is that they can easily be read out of context. But when one adds an emoticon or two, the mood, emotion or feeling behind the text becomes clearer. For example, when one sends you a text like "I'll see you tonight" you can't be sure if that person is happy about your upcoming meeting or if he is ambivalent about it. But if :-) is added at the end of the same text, you kind of get the idea that the person who sent you the text is happily looking forward to your meeting that night. So if you think you need to let someone know how you feel, combine your text with the appropriate emoticon. 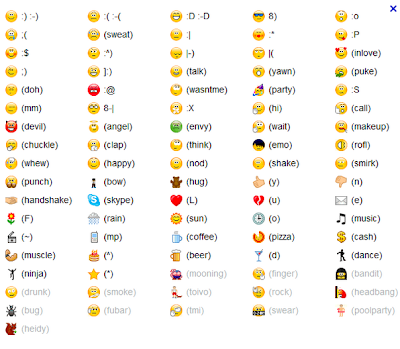 There are so many emoticons available today that you can find on the web. In fact, for every emotion, there are different emoticons that can be used to represent them. It's all in the creative combination of the characters you see on your keyboard. Some of them are static, some of them are now animated, and most of them are in color, adding a new dimension to these small characters that could mean so much more to the writer and to the recipient. 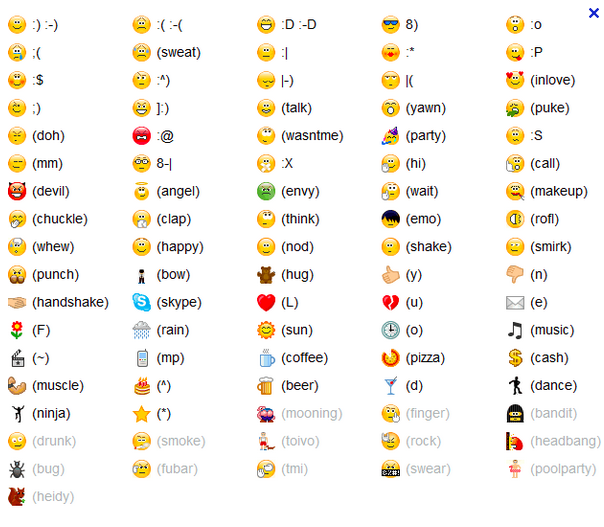 If you are new to emoticons, here are a few of the more common emoticons used in daily digital communication. The emoticons for happy, sad, mad, crying and winking are very common emoticons that most people are familiar with. What's interesting are emoticons that show the creativity of its creators. The following emoticons are cute, funny, down right silly and may prove useful to your communication style. Apart from facial expressions, there are animals and famous people emoticons below. Just make sure that when you use the more uncommon emoticons, the person receiving your message understands what your emoticons represent. Otherwise, you might get this :-/ back. The Japanese have a knack of improving upon an idea born out of the west. In the realm of emoticons, the Japanese created their own version of character-based emoticons (sometimes referred to as eastern style emoticons) that do not require people to tilt their heads to the left just to see what the emoticon is about. In the Japanese version, which came around 1986, the asterisk "*" symbol represents the eyes while the underscore "_" symbol is the mouth. To show the outline of the head or face, the open and close parentheses "(" ")" are used. So a typical face would look like this (*_*). Just like in the western style emoticons based on Falhman's original two, all that was needed to create other emoticons in the Japanese style was to change the characters used for the eyes, nose or mouth or to add other symbols. The Japanese also have what they call emoji. Emoji are based on emoticons but these are no longer combinations of letters, numbers, or symbols on the keyboard but are actual graphics. They look more like cute cartoons than anything else. These picture-based characters are fun to use and pleasing to the eyes. Emoji icons are available on different devices in and outside of Japan. Emoticons could prove to be useful in everyday online and digital communication when used correctly and with restraint. The underlying mood of a text could easily be represented by a series of letters, numbers, punctuation marks or symbols you would find on a standard keyboard. When you use emoticons, make sure to only use those that truly embody what you want to communicate. Use them sparingly because overuse of emoticons could be annoying rather than cute. Too many emoticons tend to distract from the real message of your text. Also, keep in mind that even with good intentions, there would be times when the use of emoticons might be deemed inappropriate. Always consider the target audience for your emoticon-laced text. In business correspondence, the use of emoticons would not exactly jive with the image your company or organization wants to project. Emoticons are more apt in casual messages and texts rather than in emails or other forms of text-based communications on a professional level, even if you want to wish a business colleague to have a pleasant week ahead.